The Rencontres make it possible for world renowned artists to share their experience while offering gifted students the benefit of their research. They foster a new vision of music grounded in an educational and artistic approach. 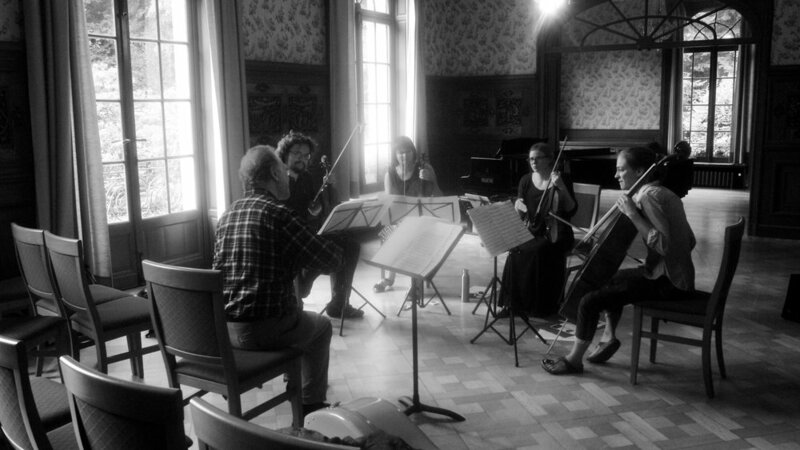 Daily classes (chamber music, lieder accompaniment and soloist repertoire) take place in the Château. These lessons allow for in-depth study of the works selected. Each repertoire must include at least one work of chamber music. Auditions are held on the first day of classes; participants may send a recording beforehand. See the list of professors having taught at past Rencontres. Students are expected to arrive at the Château on August 16 between 5:00 pm and 9:00 pm to meet their host families. Master Classes begin on the morning of August 17 and continue until the evening of August 30. Students leave the Château on August 31. Master Classes are open to the public from August 17 to the 30 between 10:00 am and 6:00 pm. Auditors may attend classes free of charge. Please inquire in advance regarding schedules for Master Classes. Enrollment in Enghien Master Classes is granted following review of your application file by the IMUSE Artistic Department. You will be informed of your acceptance to the program no later than 15 days after the application deadline. Applications must be received by July 1. Applications received after that date will be reviewed subject to availability. Enrollment is only final after receipt of a €300 deposit. IMUSE shall refund the deposit in the event that your application is rejected. Should you withdraw your application later than (15/07), no refund shall be granted. Management reserves the right to modify faculty appointments in the event of force majeure. No refund of tuition fees shall be granted in such cases. The balance of tuition fees must be paid prior to the beginning of classes. Master Classes are conducted in the historic halls of the Château d’Enghien. Students are entitled to attend all Master Classes, including those in which they do not participate. Rehearsal rooms are available from 9:00 am to 6:00 pm in various schools in the city of Enghien. All are located within convenient walking distance from the Château. Students may attend all concerts free of charge (auditions in the Château, student concerts, concerts given by professors, as well as exceptional concerts). Please have stage attire on hand for your concerts. For students enrolled prior to July 1, accommodation and breakfast are provided by host families. After this date, host family accommodations will only be provided subject to availability. Should host family accommodations be unavailable, lodging may be offered in guest houses at your own expense. You may take advantage of free shuttles between your accommodations and the Château every morning and evening, subject to daily registration. Please be aware that shuttles do not operate at other times of day. Food service is available at the cafés, bars, restaurants, bakeries and supermarkets located close to the Château. Expect to spend €5 to €10 per meal. Master Classes are limited to between 12 and 15 students. Additional participants are only accepted with the consent of the professor. Professors are assisted by piano accompanists (included in tuition fees). To ensure proper organization of Master Classes, please inform us by July 15 of the works you wish to practice with your professor. This class is intended for ensembles formed prior to enrollment. Only one member need apply on behalf of the ensemble. The names and instruments of other members must be specified on the application form. You have the possibility to attend a chamber music Master Class in addition to your instrumental classes. These Master Classes, offered according to the availability of the chamber music professor, are included in tuition fees. Please indicate on the application form your desire to participate in the chamber music Master Class and specify your preferred repertoire and / or ensemble (e.g. other students with whom you are acquainted). Participants will be organized in ensembles (quartets, trios, etc.) by the professor of chamber music. In early August, you will receive proposals for works to prepare for your chamber music class. Individual vocal or instrumental Master Classes. For lieder classes, individual vocalists and piano/vocalist duets are accepted. Complementary collective chamber music Master Classes (optional – see above). Access to rehearsal rooms with or without a piano. Tickets to all concerts, accommodations and breakfast with a host family and attendance at the various Master Classes (students enrolled by July 1). Should a registration be refused, the down payment will be reimbursed by IMUSE.